Fly straight to the top. The PPC (pay-per-click) model has turned online advertising on its head, in all the right ways. PPC has levelled the playing field, giving businesses of all sizes the chance to compete on search terms, no matter how sought-after they may be. The only way to get noticed on the web is through smart use of PPC. Right audience, right moment, right message. Thanks to our extensive experience on PPC strategy, we'll drive targeted traffic to your website - growing your brand and converting potential customers into paying customers. With our smart optimisation and management ability, you’ll get a phenomenal return on investment (ROI). The caveat here is our experience. Without it, your PPC costs can rise rapidly. Our search marketing campaigns guarantees traffic to your website, so rely on our extensive collective experience to ensure that optimal return … and reaching maximum exposure through your investment. Approach is key and our strategy is your success! Smart insight and professional industry analysis ensuring the lowest risk and highest return on your advertising spend. Showcasing sub-pages that extend the value of your ads. Our skill lies in fulfilling this objective: to target the right audience at the right moment on the right device with the right message. Timing is everything! So before we set up your campaign we conduct research around your audience and your business in order to create a winning unique strategy for instant, significant results. This allows PPC to be a key part in your online presence, and helps you to make the most of those conversions that could otherwise so easily slip away. We constantly improve your online activity by bench-marking and testing. We tweak current choices if needs be, and find new campaign opportunities as we go along. We expand your keywords, come up with optimal ad creativity and make the most of your landing pages. We’re focused. We are determined to keep your cost per acquisition (CPA) targets as low as possible. Search engine results is not the only area where PPC can work for you. Remarketing across the Google Display Network means we can target people who have already shown an interest in, and visited your website before. We constantly remind them about you with targeted messages. This smart concept yields high conversion rates and gives you more bang for your buck. PPC offers the huge advantage of real-time performance insights. This is accompanied by real-time keyword updates, ad and website conversion data, and the ability to test new opportunities, services and products. All this information is harnessed to assess and improve your chances of success. 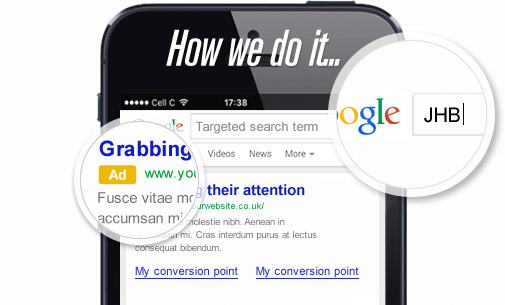 This enables us to expand your PPC even further, and employ a wider marketing strategy. Google listings triggered by traditional keyword searches. Search marketing involves bidding in keywords to drive traffic to your website when people search for certain things. For the best results, accounts need to be set up professionally. This ensures maximum return and minimal wasting of funds. Adverts are aimed at drawing your previous website visitors back to your site with a fresh approach. Remarketing targets people who have already visited your website before. We approach your audiences with targeted messages that relates to their interest. This smart concept yields high conversion rates and gives you more bang for your buck. Banner Ads and YouTube advertising can be extremely effective in driving the right visitors to your website. Our creative team comes up with smart ways of getting the most attention out of these clever marketing tools, for optimal results. We have plenty of experience in running PPC campaigns, with successful results in many varied sectors.